According to the latest report from Strategy Analytics, the iPhone 7 was the best selling smartphone in the first quarter of 2017 and the iPhone 7 Plus was the second one. Apple shipped 21.5 million units of the 4.7-inch model and 17.4 million units of the 5.5-inch device. This allowed Apple to take 11% of market. The third best selling smartphone was OPPO R9s, which is being heavily promoted in Asia and India. The fourth and the fifth places in the Strategy Analytics are occupied by Samsung’s Galaxy J3 and galaxy J5. 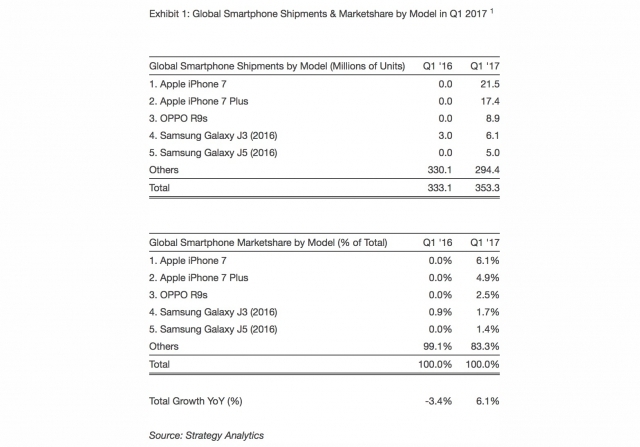 Global smartphone shipments in the first quarter of 2017 accounted for 353.3 million units. The market grew 6.1% compared to the first quarter of 2016. Later this year, Apple will introduce the iPhone 8 along with the other two models, the iPhone 7s and iPhone 7s Plus. These devices will boost the iPhone sales.